4 Who else do we interview? 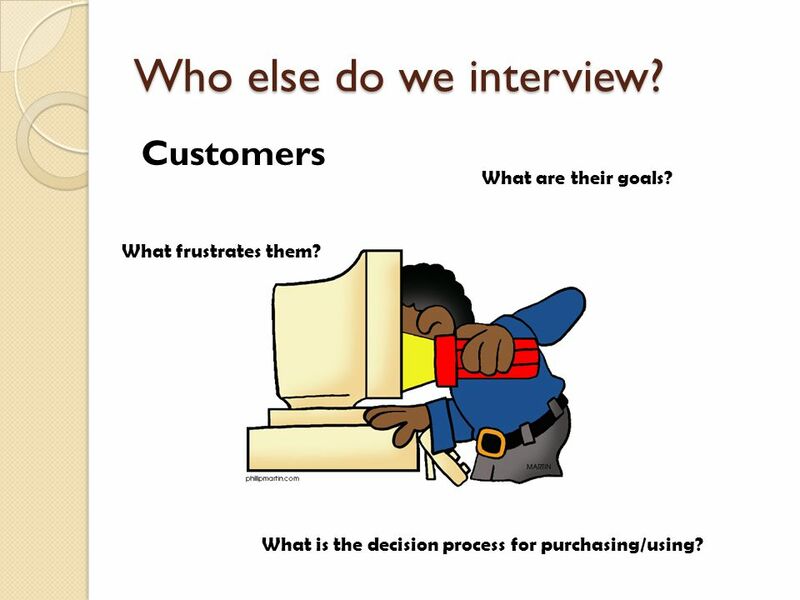 Customers What are their goals? What frustrates them? What is the decision process for purchasing/using? What activities currently waste your time? What is most important to you? What helps you make decisions? 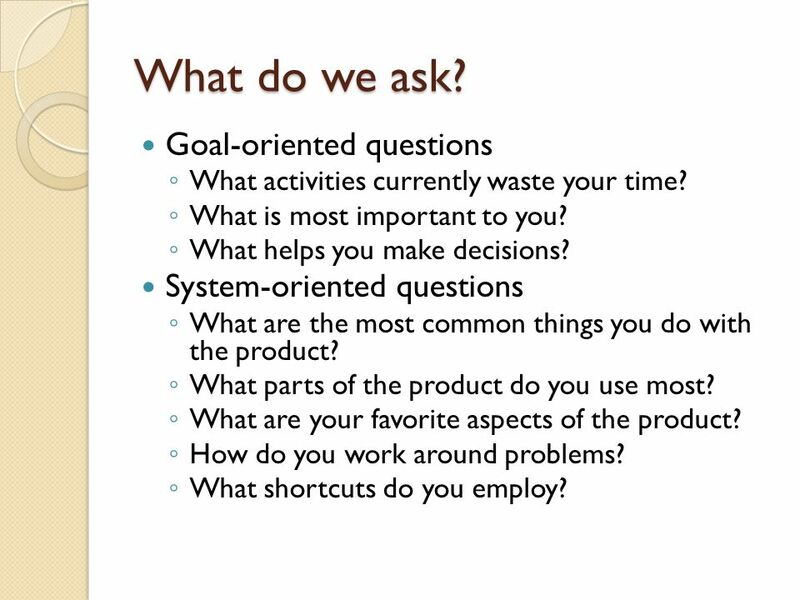 System-oriented questions What are the most common things you do with the product? What parts of the product do you use most? What are your favorite aspects of the product? How do you work around problems? What shortcuts do you employ? Avoid a fixed set of questions Focus on goals first, tasks second Ask for show and tell I want to collect money owed me. I want a list of people with open balances. 7 More interview tips Avoid making the user a designer. 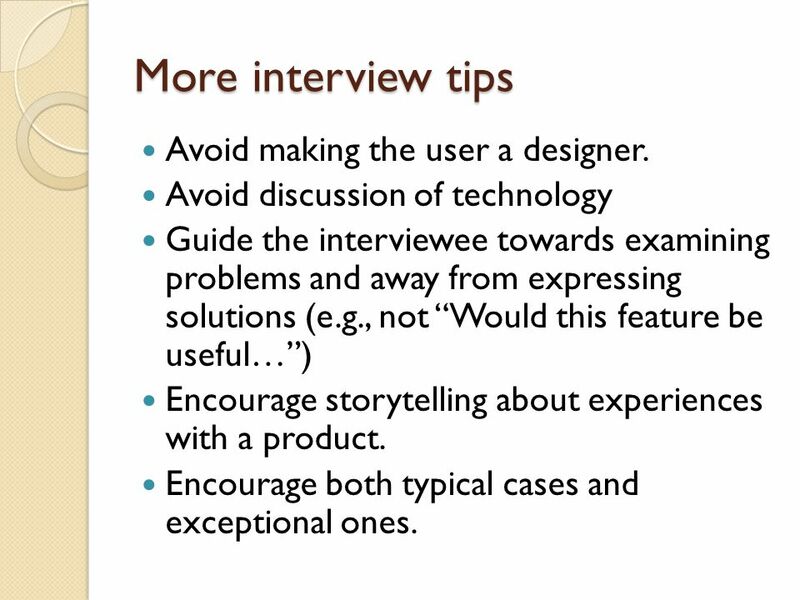 Avoid discussion of technology Guide the interviewee towards examining problems and away from expressing solutions (e.g., not “Would this feature be useful…”) Encourage storytelling about experiences with a product. Encourage both typical cases and exceptional ones. Why do you come to the website? What do you primarily use the site for? Is there anything on the site that prevents you from doing what you need to do quickly and efficiently? Is what you need present? What sort of information do you expect when searching for a school? 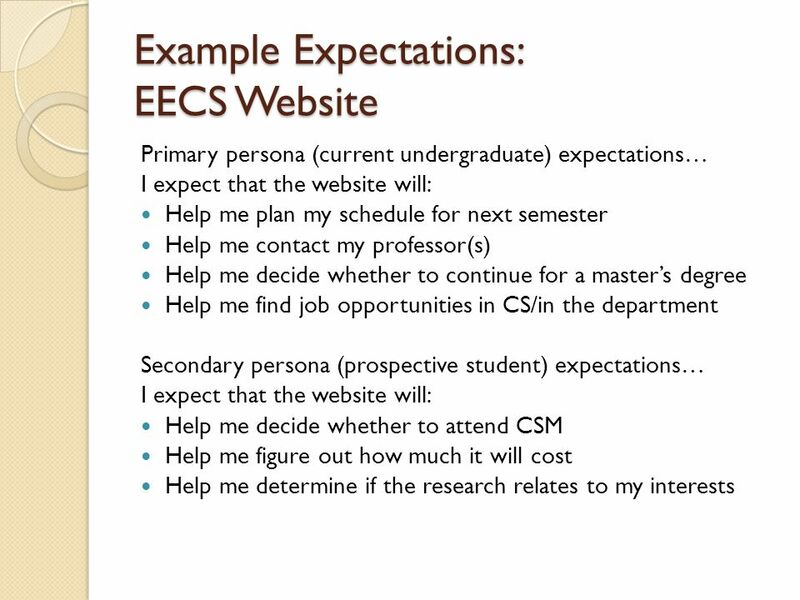 Did anything on our EECS website convince you to do your graduate work here? 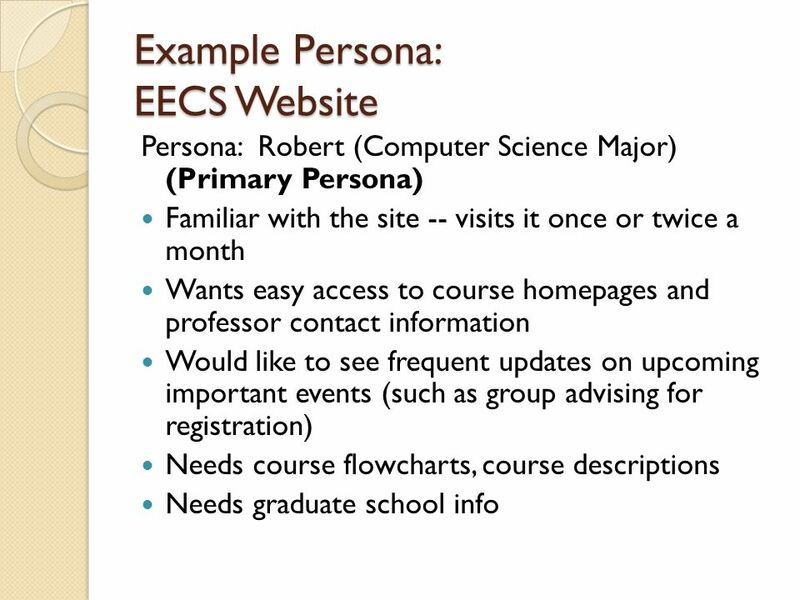 Is the current color theme of the EECS page appealing? 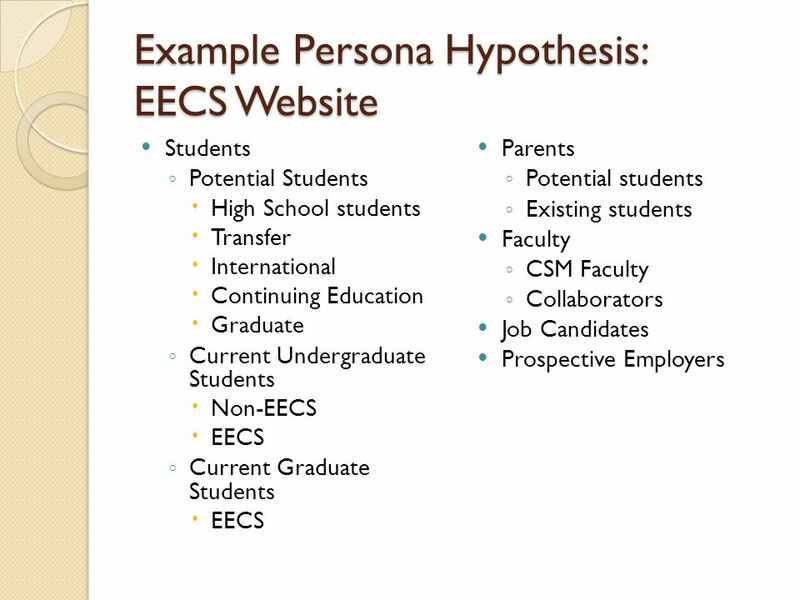 Persona Hypothesis. What different sorts of people might use the product? 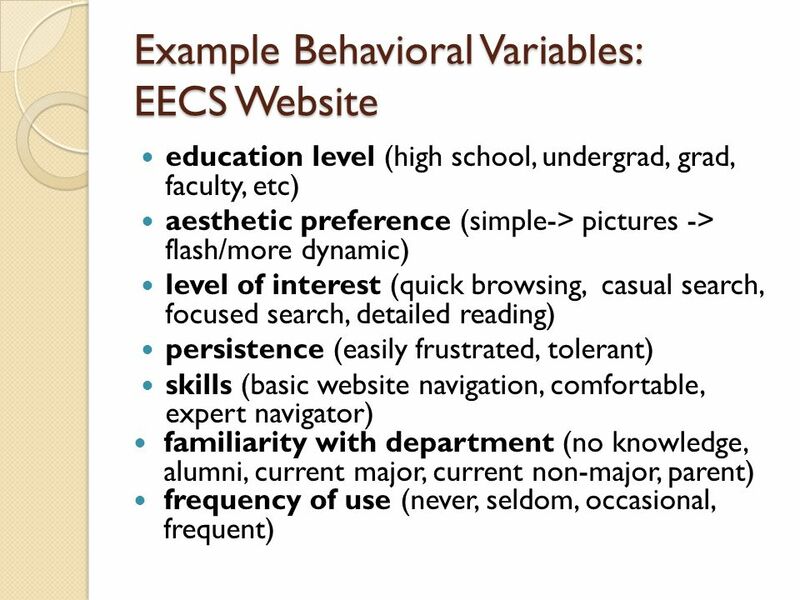 How might their needs and behaviors vary? 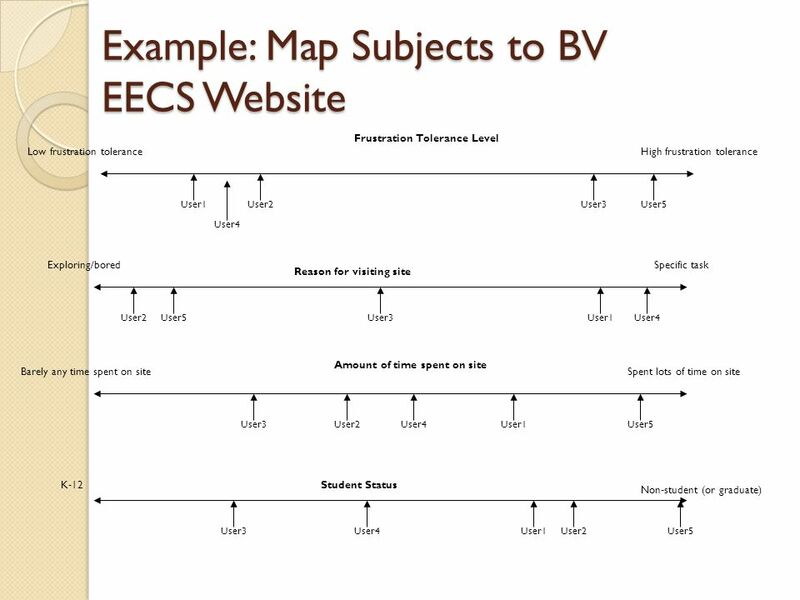 What ranges of behaviors and environments need to be explored? 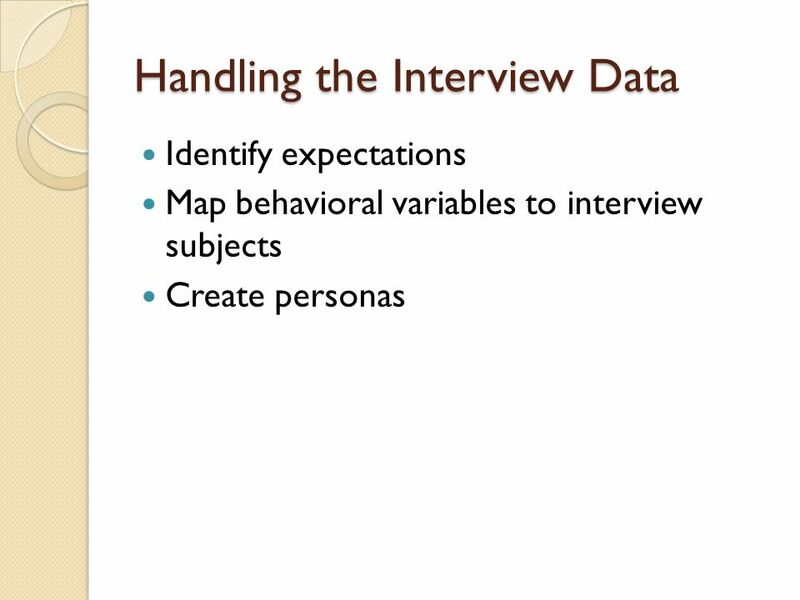 May also identify behavioral and demographic variables. 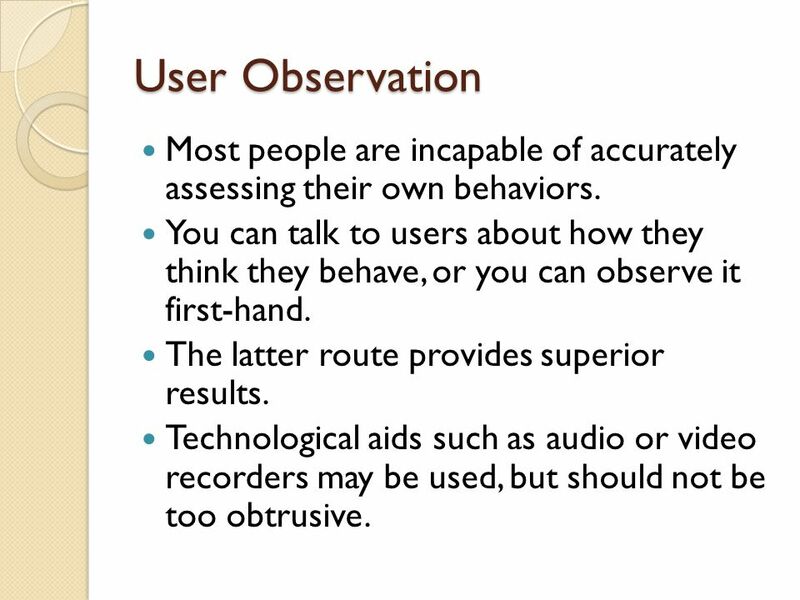 12 User Observation Most people are incapable of accurately assessing their own behaviors. You can talk to users about how they think they behave, or you can observe it first-hand. The latter route provides superior results. Technological aids such as audio or video recorders may be used, but should not be too obtrusive. Task: Find out what classes are going to be offered next semester. 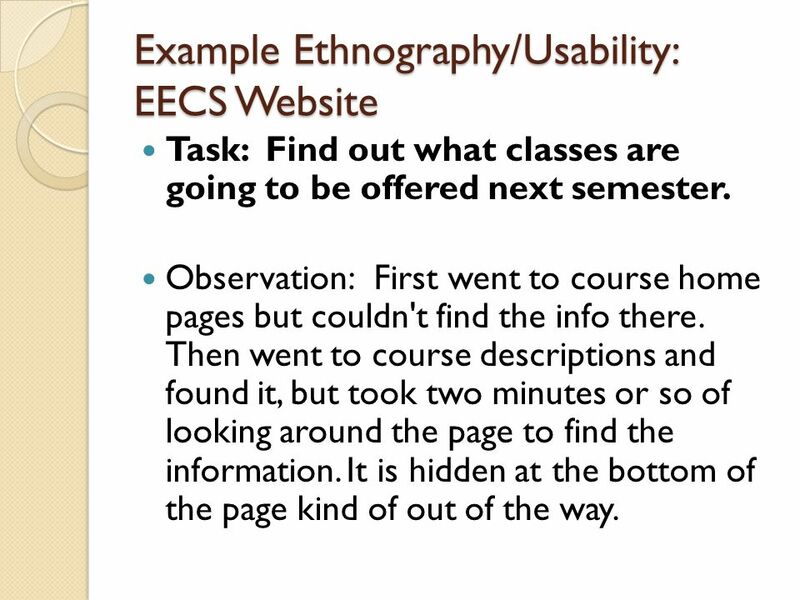 Observation:	First went to course home pages but couldn't find the info there. Then went to course descriptions and found it, but took two minutes or so of looking around the page to find the information. It is hidden at the bottom of the page kind of out of the way. Lots of sitting and staring at screen. 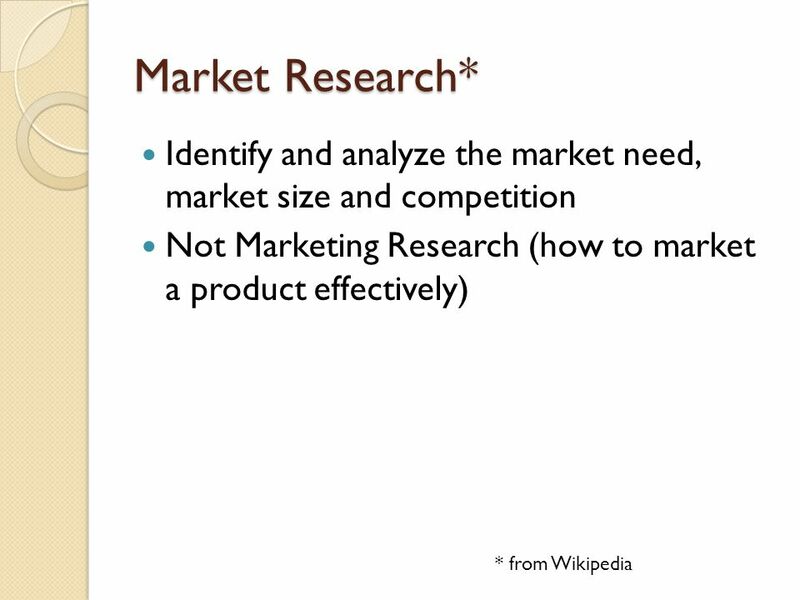 Frequent switch to explanation of assignment Looking for specific details as opposed to rereading assignment Lot of time reading lab description for insight. Frequent switching between .h and .cpp without adding code to either. Lot of confusion about what goes in each section. No textbooks in sight Lots of warnings, errors that won’t go away. Compile, receive error, remove line, recompile, still have error. Rely on error messages from IDE, but often don’t understand the message. 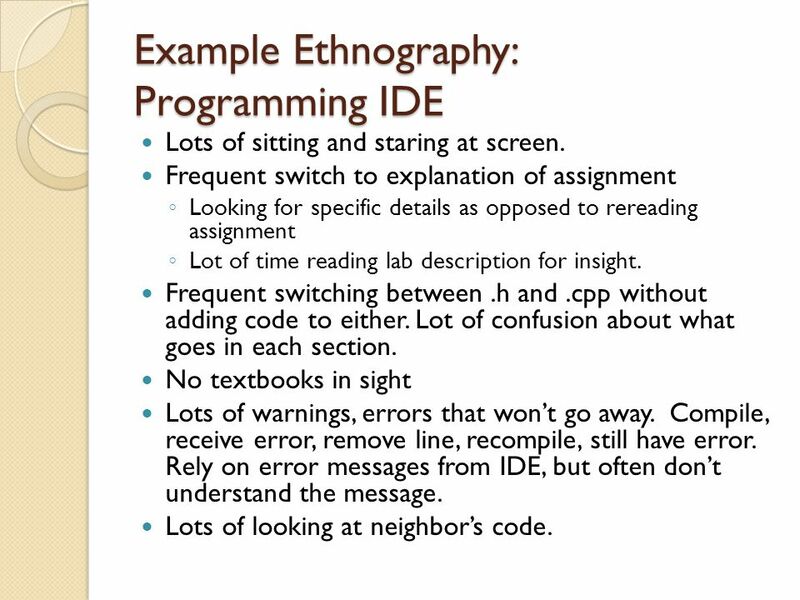 Lots of looking at neighbor’s code. 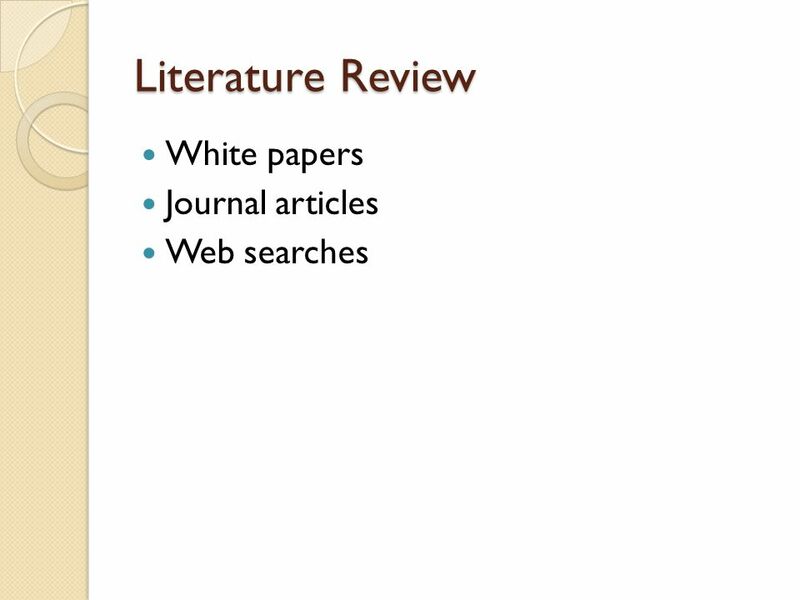 No one googled errors Students not making much use of resources like chapter notes. 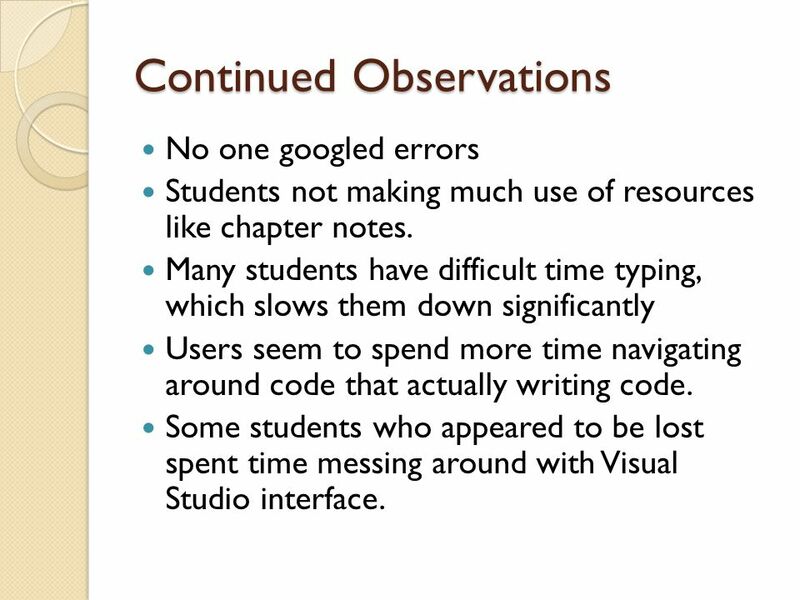 Many students have difficult time typing, which slows them down significantly Users seem to spend more time navigating around code that actually writing code. Some students who appeared to be lost spent time messing around with Visual Studio interface. 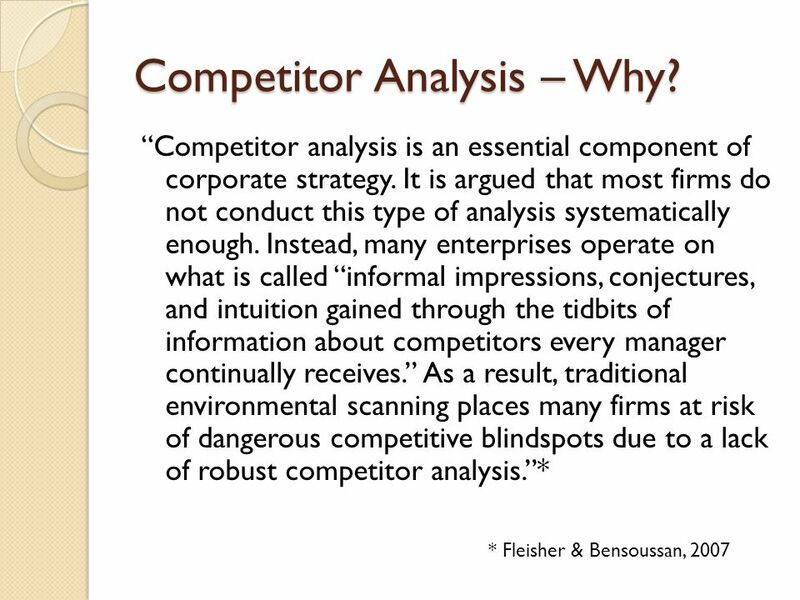 17 Competitor Analysis – Why? 18 How? 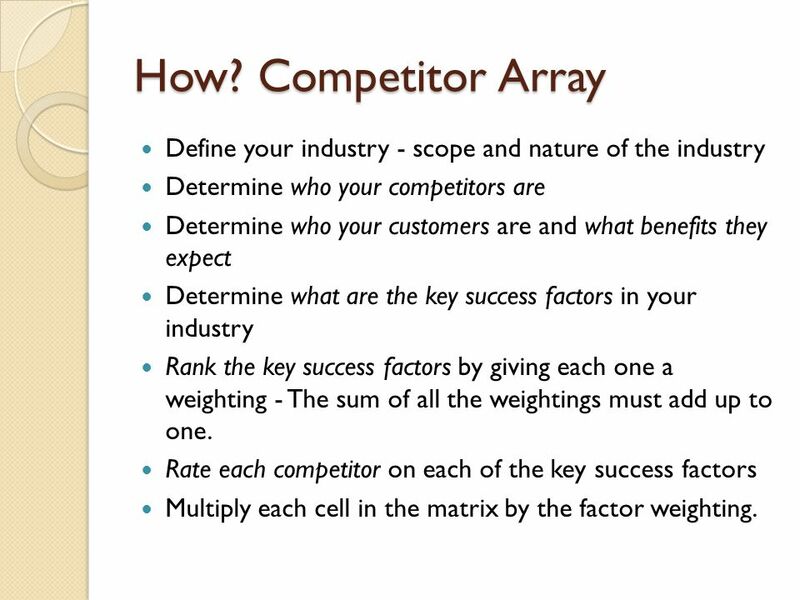 Competitor Array Define your industry - scope and nature of the industry Determine who your competitors are Determine who your customers are and what benefits they expect Determine what are the key success factors in your industry Rank the key success factors by giving each one a weighting - The sum of all the weightings must add up to one. 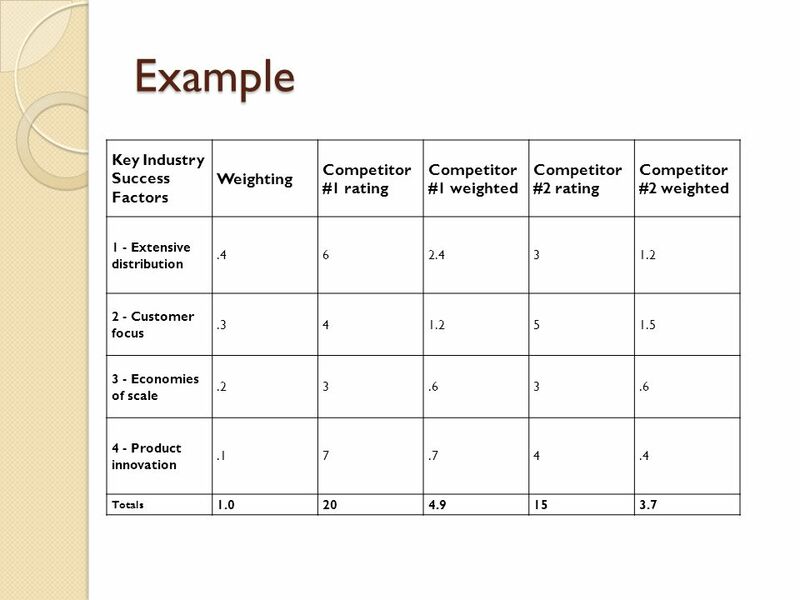 Rate each competitor on each of the key success factors Multiply each cell in the matrix by the factor weighting. 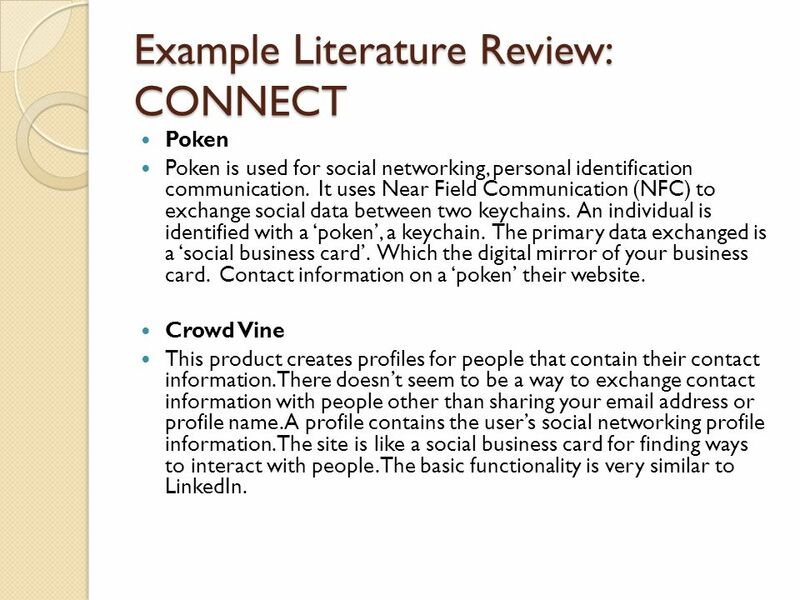 Poken Poken is used for social networking, personal identification communication. It uses Near Field Communication (NFC) to exchange social data between two keychains. An individual is identified with a ‘poken’, a keychain. The primary data exchanged is a ‘social business card’. Which the digital mirror of your business card. Contact information on a ‘poken’ their website. Crowd Vine This product creates profiles for people that contain their contact information. There doesn’t seem to be a way to exchange contact information with people other than sharing your address or profile name. A profile contains the user’s social networking profile information. The site is like a social business card for finding ways to interact with people. The basic functionality is very similar to LinkedIn. 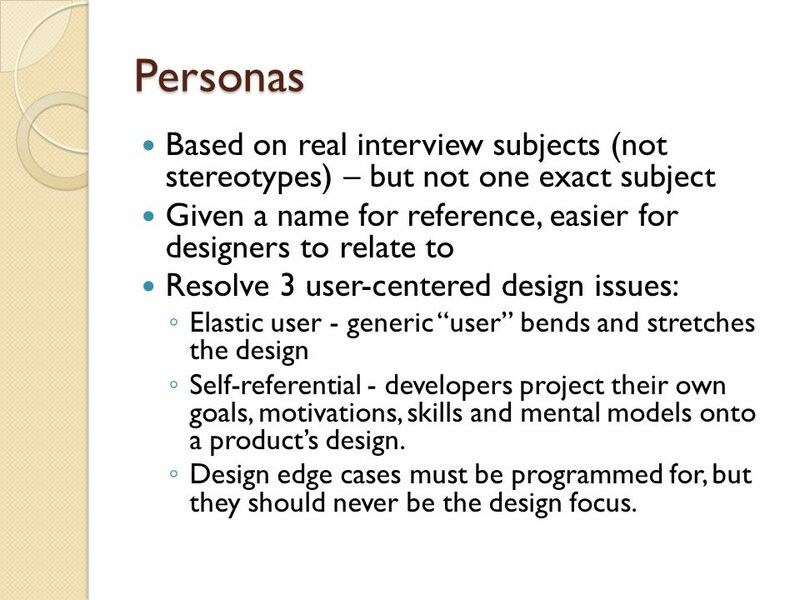 26 Personas Based on real interview subjects (not stereotypes) – but not one exact subject Given a name for reference, easier for designers to relate to Resolve 3 user-centered design issues: Elastic user - generic “user” bends and stretches the design Self-referential - developers project their own goals, motivations, skills and mental models onto a product’s design. Design edge cases must be programmed for, but they should never be the design focus. 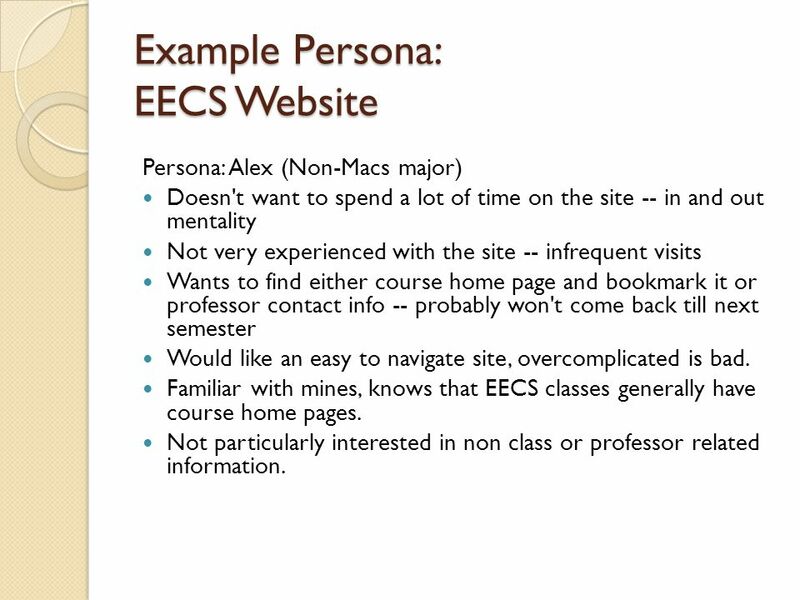 Persona: Alex (Non-Macs major) Doesn't want to spend a lot of time on the site -- in and out mentality Not very experienced with the site -- infrequent visits Wants to find either course home page and bookmark it or professor contact info -- probably won't come back till next semester Would like an easy to navigate site, overcomplicated is bad. 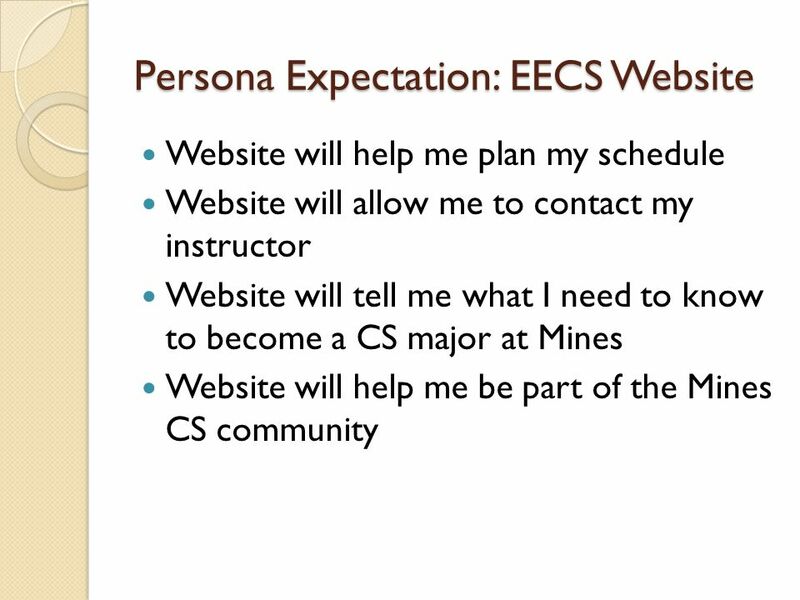 Familiar with mines, knows that EECS classes generally have course home pages. Not particularly interested in non class or professor related information. 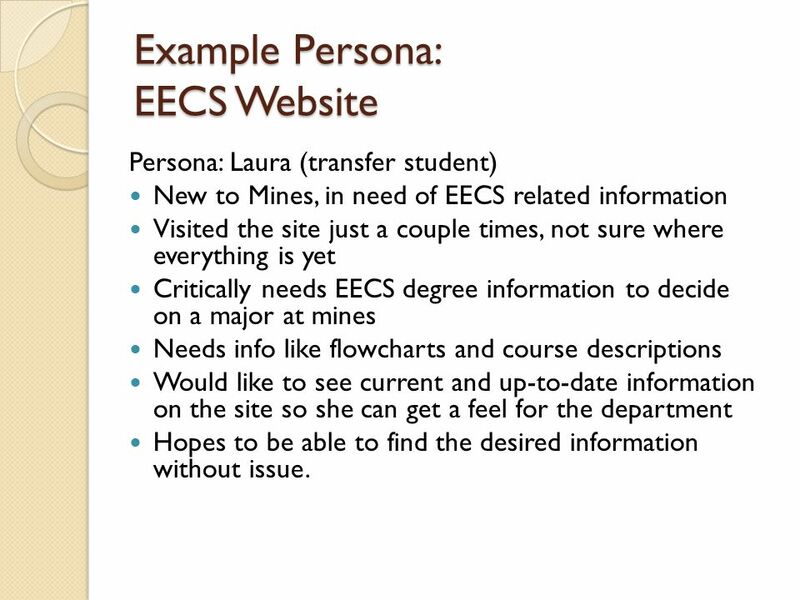 Persona: Laura (transfer student) New to Mines, in need of EECS related information Visited the site just a couple times, not sure where everything is yet Critically needs EECS degree information to decide on a major at mines Needs info like flowcharts and course descriptions Would like to see current and up-to-date information on the site so she can get a feel for the department Hopes to be able to find the desired information without issue. 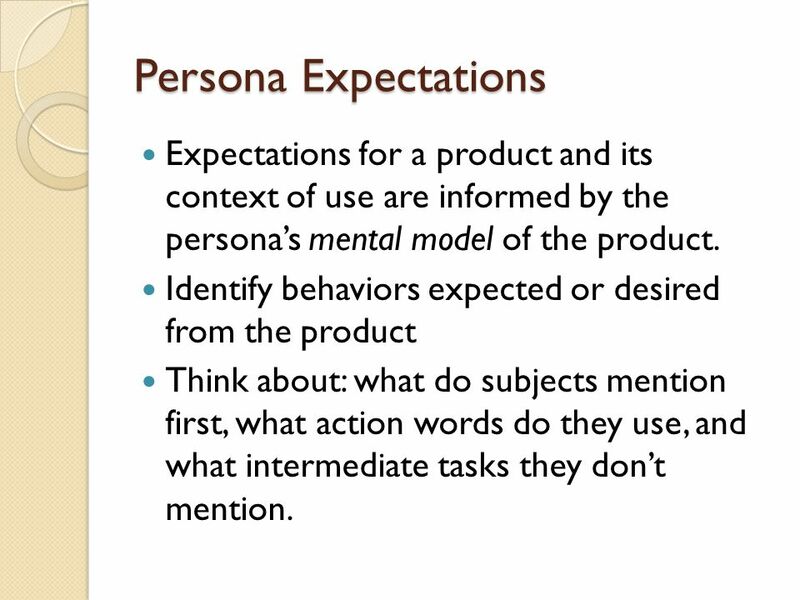 30 Persona Expectations Expectations for a product and its context of use are informed by the persona’s mental model of the product. 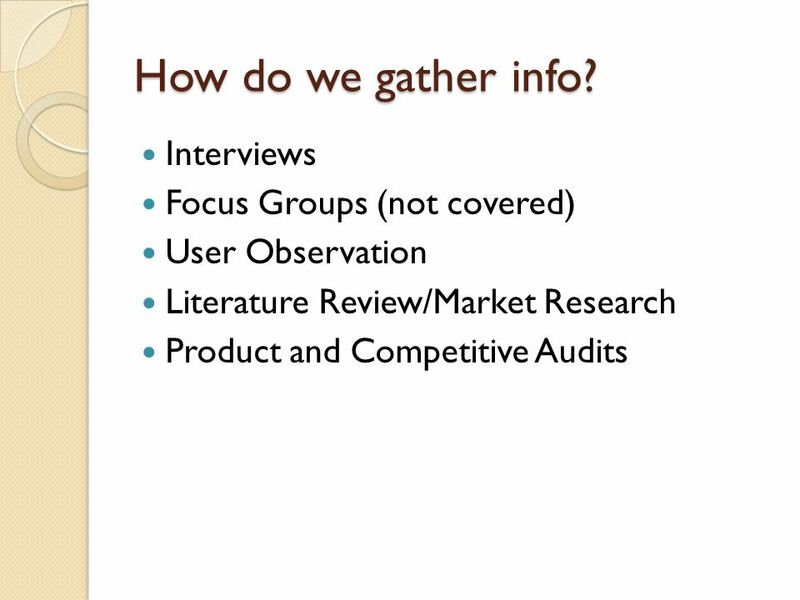 Identify behaviors expected or desired from the product Think about: what do subjects mention first, what action words do they use, and what intermediate tasks they don’t mention. 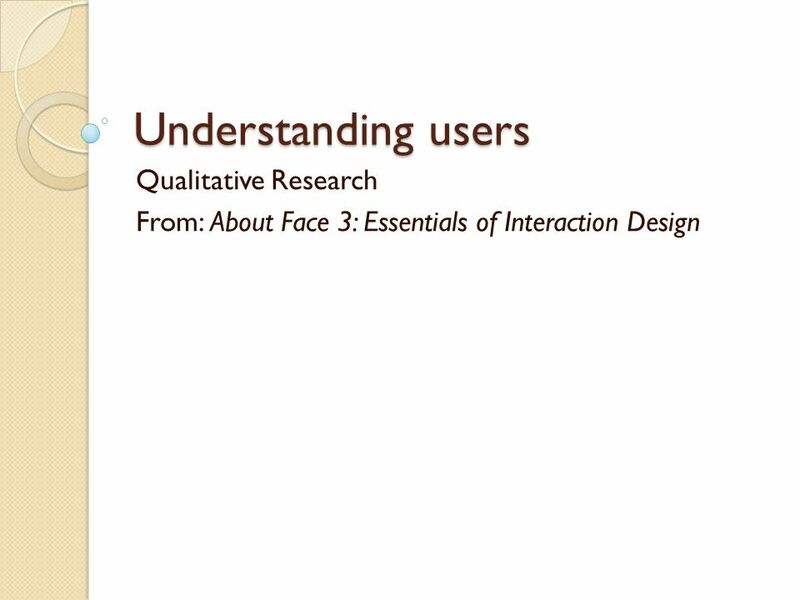 Download ppt "Understanding users Qualitative Research"
Foundations and Strategies Attention Investment CS352. 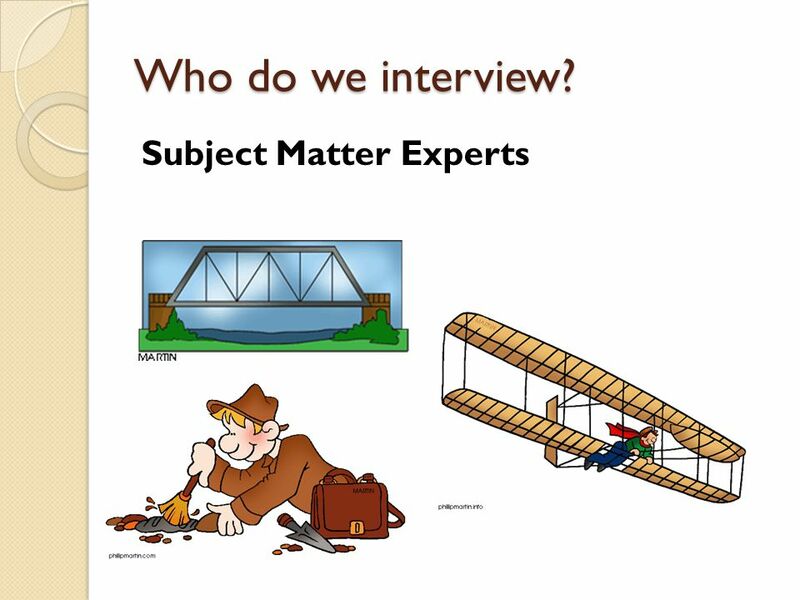  Better preparation before the interview  Develop a point of view / personal brand  Create a “springboard” for intelligent dialogue  Deeper engagement. Virtual University - Human Computer Interaction 1 © Imran Hussain | UMT Imran Hussain University of Management and Technology (UMT) Lecture 20 User Research. John A. Bers John A. Bers Associate Professor of the Practice Management of Technology Program Nov. 5, 2003 Vanderbilt University School of Engineering. I’m young and employed PROJECT IDEA FOR EUROPE NEEDS YOU 4 JOB-CREATION. 1 Working with Social Media in Research Settings Victoria Wade Careers Consultant. 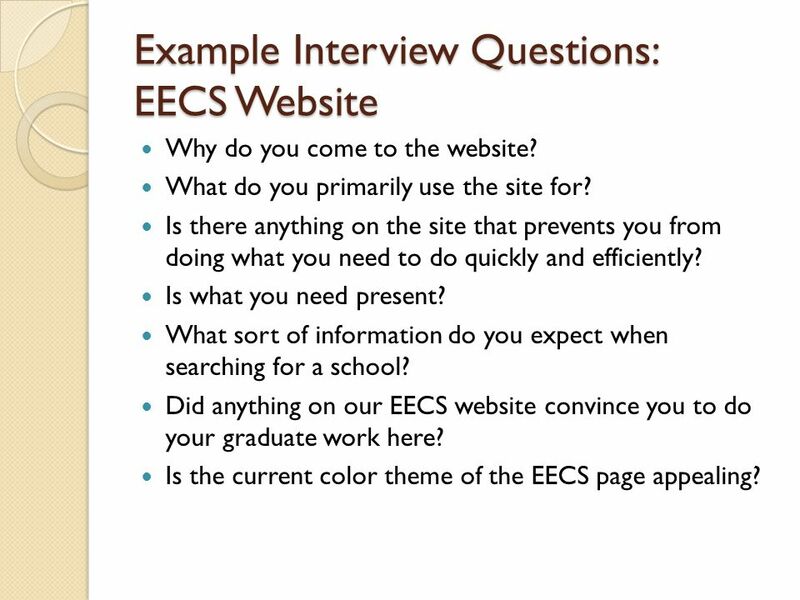 May 5, 2015 Strategies for Evaluation Data Collection Eric Graig, Ph.D.
Mass Digitization of Archival Manuscripts To ThisGoing from this. 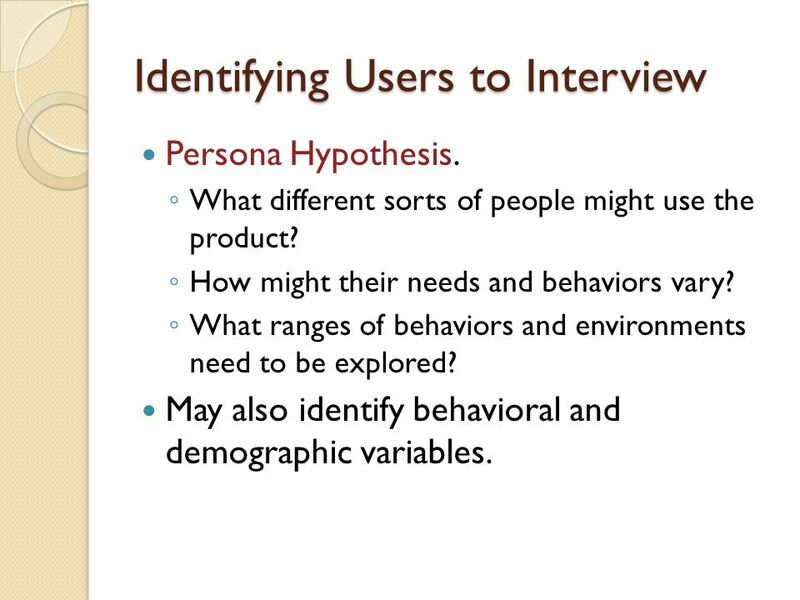 William H. Bowers – Understanding Users: Qualitative Research Cooper 4. Social Media: FACEBOOK Kristin Martin Professional Development. WEB2.0 Social Media & Independent Pharmacy Real World Use & Possibilities. North Plainfield High School. RESPONSIBILITY IN HIGH SCHOOL CHOOSING RESPONSIBLY IN COLLEGE * High school is mandatory and usually free. * College is. 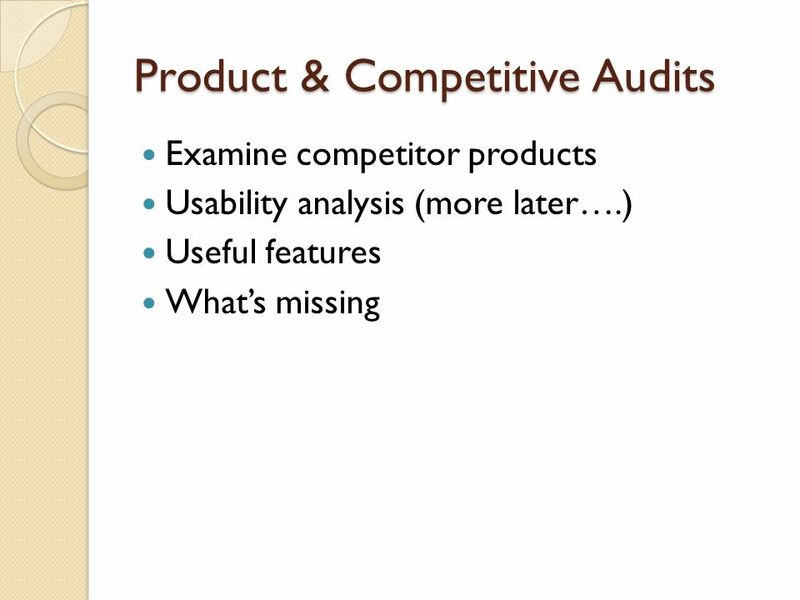 Requirements Gathering this process determines exactly what is required (and not required) of a project Three key areas include: Identify and prioritize.